Select the "Forgot Password" link on the Login screen. Enter your email address and choose "Reset my Password." You must enter the email address that you registered with. If you do not enter the email address that you registered with, you will receive no reset password email. You should then receive an email with a link to reset your password. Please visit your email inbox, open the email, and create a new password. 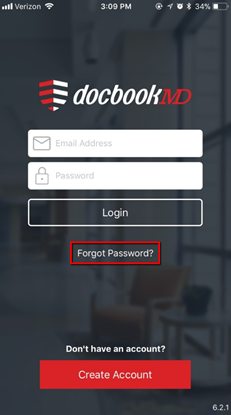 Then please navigate back to DocbookMD and log in with your new password. If you are still unable to login, please contact DocbookMD Support.